Student Athena Del Rosario helped organize an upcoming free children's soccer workshop to give others a taste of the skills she learned from the sport. 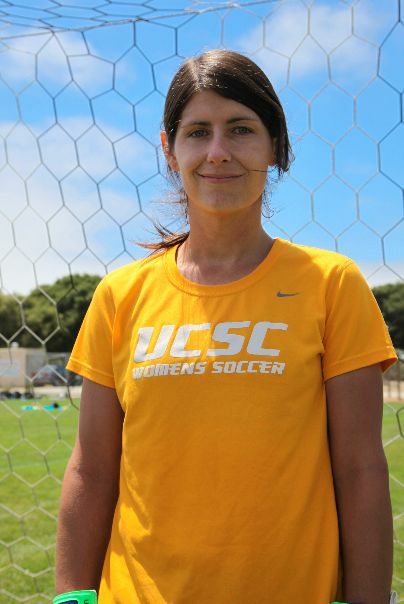 The UC Santa Cruz women's soccer squad has a cumulative GPA of 3.35—the highest in the UC system, according to coach Emily Scheese, above, who earned a Ph.D. in literature from UC Santa Cruz in 2012. The soccer players who do the workshops with kids. Although she didn’t find out until high school, Athena Del Rosario was diagnosed with autism as a young child. The fact she had a hard time communicating and relating to other people was part of her disorder. But that changed, says Del Rosario, when she discovered soccer. She learned to talk to people, to socialize, to appreciate the support of her teammates through tough times. It also made her a better student. “I’m out here now doing things my parents never thought I would do,” she says of her time at UC Santa Cruz. It’s part of the reason Del Rosario helped organize a free soccer workshop for the children of students living in Family Student Housing—or any child of students or faculty, for that matter. She wants others to get a taste of the skills she learned from the sport. 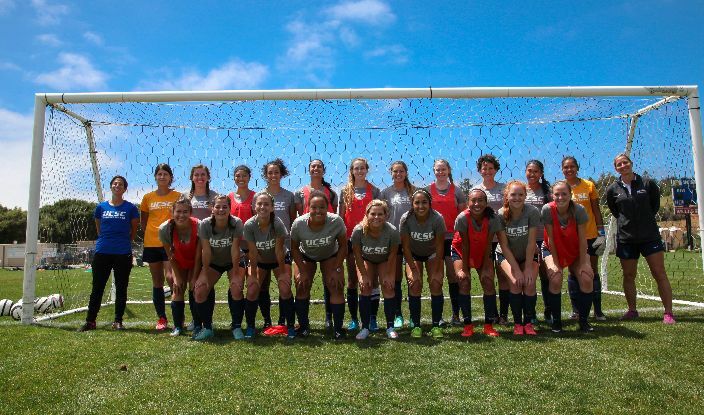 The event was May 15 on the Oakes Field and included skill exercises, coaching, and games led by members of UC Santa Cruz’s women’s soccer team. This year, the team won the conference title for the NCAA Division III Great South Athletic Conference and advanced to the NCAA national championship tournament. 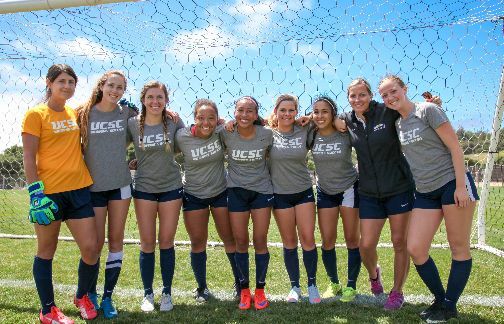 It also won the National Soccer Coaches Association of America’s Team Scholar Award with a cumulative GPA of 3.35—the highest in the UC system, according to coach Emily Scheese, who earned a Ph.D. in literature from UC Santa Cruz in 2012. The squad is peopled with students majoring in subjects from creative writing to engineering. Many excelled in their club and high school soccer teams. But what sets the group apart is that for 12 weekends of the year, the team goes into the community to coach soccer clinics for local kids. Partnered with the Aptos Tide soccer club, the athletes not only teach skills but also help participants gain confidence and make friends. About 100 students from ages 4 to 12 participated this year. 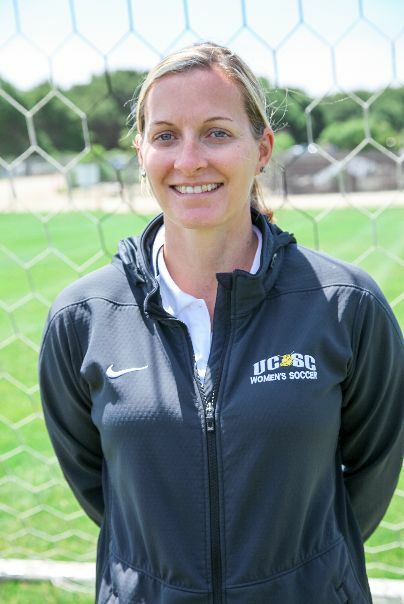 Standing on a wind-swept soccer field on the UC Santa Cruz campus after a rigorous practice, Scheese says the team is a cohesive, hard-working group that has gone beyond expectations. For more information, contact Scheese at (831) 459-3362.